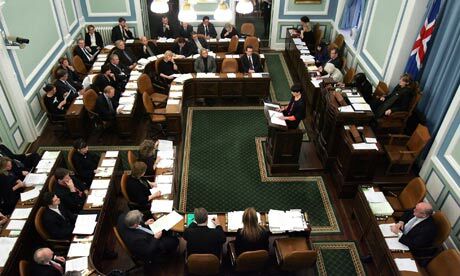 “I believe this is the first time a constitution is being drafted basically on the internet,” said Thorvaldur Gylfason, member of Iceland’s constitutional council. Iceland’s existing constitution dates back to when it gained independence from Denmark in 1944. It simply took the Danish constitution and made a few minor adjustments, such as substituting the word “president” for “king”. In creating the new document, the council has been posting draft clauses on its website every week since the project launched in April. The public can comment underneath or join a discussion on the council’s Facebook page. Given that it was intended to go to a referendum, Gylfason said, the idea was that the public should be involved from the start of the process and not just at the end. Social media is seen as a way of making that happen with Iceland’s population among the world’s most computer-literate. Two-thirds of its people are on Facebook. Posted on June 11, 2011, in research. Bookmark the permalink. Leave a comment.